Wanaka Medical Centre has been providing quality healthcare to the Wanaka community since 1980. They have continued to expand their team, and medical services ever since. And, given the talented nature and undeniable passion behind the Wanaka Medical Centre, they’re certainly here to stay. Our initial challenge was based around trust. Every interaction with the website, needed to contribute towards building a relationship based on trust. 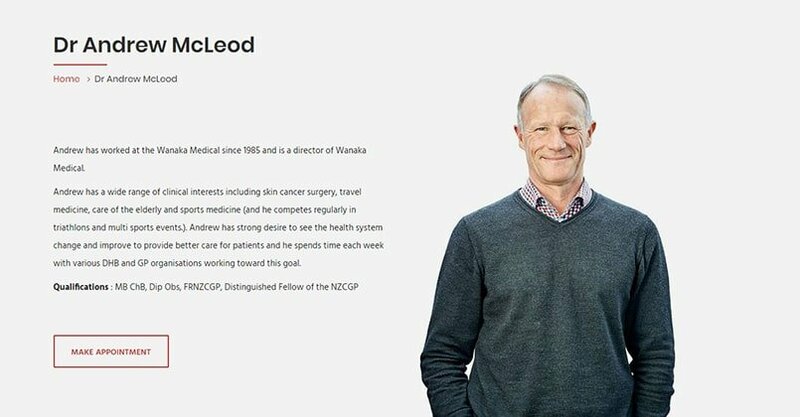 We needed to build confidence in new patients, encouraging them to get in touch, to resolve their medical concerns with the Wanaka Medical Centre. Once the user experience was thoroughly researched and planned, we turned our focus onto increasing the medical centre’s visibility online. To help them stand out. The Wanaka Medical Centre is situated about 10 meters from their biggest competition. There needed to be no doubt around who they were, and how to enrol. The branding offered an immediate point of difference, so our job was to make sure new patients reached the website first. Our proven SEO techniques made this possible. Now that the web design is inline with the state of the art care that this passionate team offers, we can leave the real challenges up to them.